With this years Vertical Blue freediving competition just around the corner, I thought I’d take the opportunity to delve into the history books to recount one of the most epic battles I have ever seen in freediving, a battle for the ages that perhaps comparatively few people know about. A battle for female supremacy in the first open invite Vertical Blue which took place in November of 2012 between Czech Alena Zabloudilova and American Ashley Futral Chapman. Alena Zabloudilova arrived into Long island fresh off of her victory at Triple Depth in Dahab, Egypt. 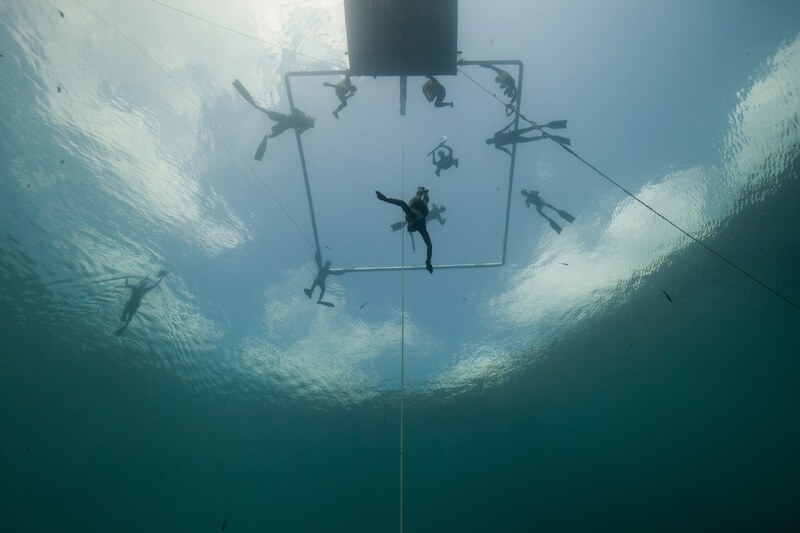 The renowned three day competition takes place over consecutive days with divers competing in each of the depth disciplines of free immersion(FIM), constant weight(CWT) and constant no fins(CNF). This was a competition where she not only beat all of the female participants, she also beat all but one of the men. 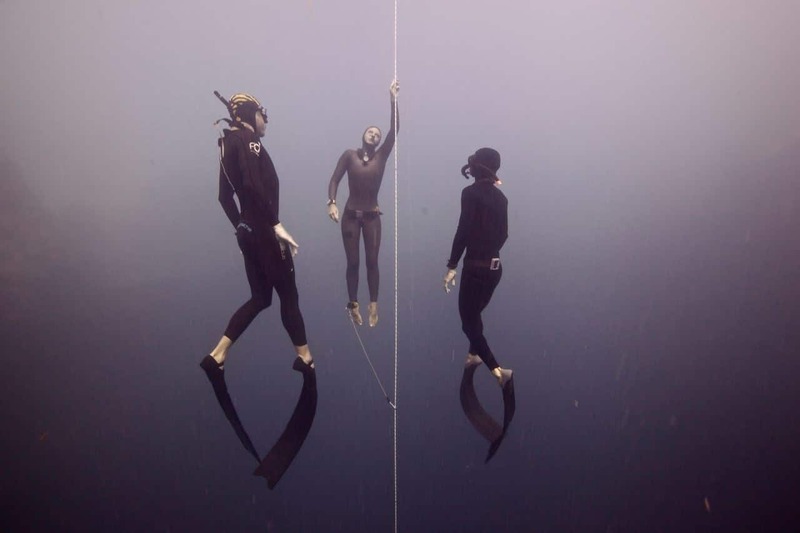 With dives including an 80m CWT, an 82m FIM and a 57m CNF, Alena continued to impress the freediving world with her fast progression into the world of depth freediving, having only taken up this side of the sport the year prior. Originally trained by Martin Zajac of Apneaman, I was lucky enough to have her as a training partner during the final quarter of the year, including lead up to ‘Triple depth’ and ‘Deep Dahab’ competitions. 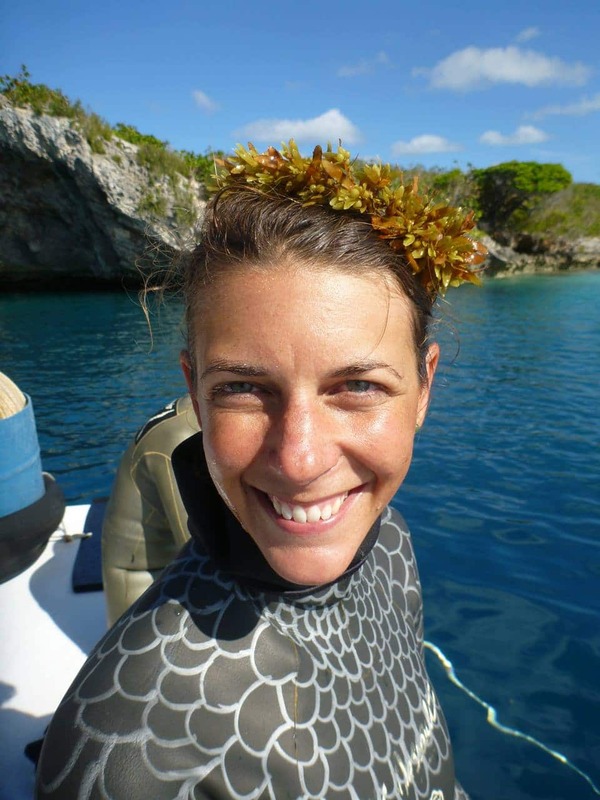 Across the Atlantic, Ashley Futral Chapman had been busy making waves herself. With a focus on perhaps the most challenging of the disciplines, constant no fins, she had been busy exchanging world records with the legendary late Natalia Molchanova. First breaking the record in April with a 63m dive, and then again with 65m dive, Ashley would now, once again try to reclaim the record from Natalia. I had been lucky enough to be invited to join the Vertical Blue safety team that year whilst on a training trip with Vertical Blue organizer William Trubridge to Tenerife. My main focus of that year was to win the overall crown at Triple depth and to continue my pursuit towards that magical three-digit number. Having achieved both goals, I was content to take a break from competitive freediving and be involved in a different aspect of the game. On my very first visit down to the blue hole, I was quickly impressed at the level of the diving taking place. At that time, I was the deepest man residing in Egypt. There weren’t too many people diving deeper than 90m’s in Dahab, so to see so many of the guys pushing 90m+ dives, Miguel Lozano doing an impressive 108m FIM dive, and William Trubridge doing a clean and easy 100m no fins dive, I knew this competition was shaping up to be something special. And as a safety diver, I had the best seat in the house. With Alena struggling from jet lag and an already long competitive season, I helped her devise a game plan, one that would allow her to rest her body whilst preparing her mind for what was to come. She had less than a week on Long island before the comp was due to start and she trusted me enough to try an alternative approach, one that did not include any ‘deep’ diving. Having dived with her for the previous 2 months on a daily basis, I already knew her strengths and potential. I knew that if she could arrive to the competition well rested, there would be very few, if any, who would stand in her way. With power and precision, she pulled and then kicked her long, lean body through the water, with initial strokes coming one after the other, they then softened as the negative buoyancy began to take hold. 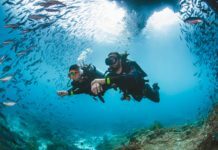 She continued to pull and glide until she finally succumbed to the pressure, allowing her body to sink effortlessly down into the depths and darkness that is Deans Blue hole. A time for the body to relax but for the mind to stay strong. Give in to the darkness and allow yourself to become but a spec of consciousness. Or try to fight it and it can feel like an eternity! Monitored by sonar from the surface, we were able to follow her progress during the entire dive. As the platform coordinator Sam announced her approach towards the plate, a huge cheer went up from the onlookers as she first touched, turned and then began her return towards the surface. Back down in the darkness, more than 200 feet below, upon reaching the plate, Ashley Chapman’s first feeling was relief. Then, as she placed her tag inside her hood, she knew the hard part was yet to come. Whilst she knew her body was conditioned for this dive, having put in the hours of sweat and hard work, she also knew it would take her very all to get there. Methodically, she swam through the darkness, focusing on technique, extending her arms up before driving them down again against the water. Kick, pull, glide. Kick, pull, glide. Past the 60, passed the 50, passed the 40m mark. Her arms and shoulders began to burn as the lactic acid continued to build, her muscles deprived of oxygen and forced to burn the energy stores residing within her muscles. Ashley’s mental resolve was apparent. With her primary objective complete and her presence as a major player on the scene announced, in the coming days, she would move her focus to the other disciplines. Alena’s first dive was one maybe slightly less physically demanding than the performance Ashley had just put in but still no less daunting. In this discipline athletes find themselves without fins for propulsion, often deeper than they could swim up without assistance. The rope is their life line, their only means back to humanity. Alone, in the darkness, this is a thought that often preys on the mind. Alena had announced an 80m FIM dive. Though she had done a little more in past performances, this would be her first real deep dive since arriving. A dive that would take her more than three minutes to complete, it would be a real test of her mental resolve. As the primary safety diver, I had the best seat in the house to watch this performance. Alena gracefully pulled her way down the line, calm and relaxed, descending from view into the murky depths, away from humanity and into the abyssal darkness. We followed her progress via sonar, willing her on with both excitement and anxiety. As she touched down on the plate and then began her ascent, I felt a wave of relief and began to focus on myself as I prepared to dive down and meet her. As Alena cruised passed 60m on her way up, I made my duck dive and began my descent. Moving at about 1 meter per second, I knew I would reach my target depth of 30m just as she would be coming into sight. I swam until about 22m, began my free fall and then flattened out in the final meters to slow my fall. Alena appeared out of the darkness, a few meters below me, pulling and gliding along the rope with purpose and with power. I gave a grouper call(a guttural sound from the throat) to announce my presence and she gave a smile. Looking strong, we continued the ascent together, joined by the second safety at 20m. As the positive buoyancy began to take over and each pull gave more glide through the water, I knew she had it in the bag. She broke the surface, removed her nose clip and effortlessly completed her surface protocol. Over the next days, the girls exchanged blows. Alena struck with an 86m constant weight dive and Ashley returned with a 76m free immersion dive. With the deepest diver of each discipline being awarded 100 points for their performance(regardless of depth) and all other divers being awarded a percentage of this, Alena now sat on 200 points and Ashley 195. This meant that at the end of the first act(first set of three- three day blocks) Alena had a slender five point lead. With each girl still needing to complete a third discipline to improve their overall points tally, things were sure to heat up over the coming days! Day four saw both girls sitting out, choosing to take an additional day to help recover and prepare themselves mentally for the dives still to come. On day five, both girls returned to action, attempting to close the gap in their competitors strongest discipline. Ashley went first with an American national record, a solid 82m CWT dive, momentarily putting her into the lead. Alena’s answer was a clean and precise 62m CNF dive, also a national record. Now with all three disciplines completed, this is how the score card read. Ashley sat on 290.3 points, Alena 292.5. Alena still had the lead, but the gap was closing. Both Alena and Ashley were back in the water the very next day, again attempting national records. Alena dove first and became one of only three women at the time to reach 90m in the competitive disciplines with her constant weight dive. Ascending with her arms by her side, her powerful legs drove her to the surface where she met the judges, safety and spectators with her infectious smile! Only minutes later, it was Ashley’s turn. Not only would her dive to 82m FIM be a national record, it would also be a continental record and the third deepest of any woman in this discipline. But it was also new territory for her and a good five meters past her previous personal best. You never would have guessed it though by the way she accomplished her dive. Her equalization was good, her dive time was good, and her physical conditioning was good. She looked strong from start to finish. Ren and Ashley were proving to be a formidable team and now, at the end of the act, out of a maximum 300 possible points there stood but 0.2 points between them. Ashley Chapman- 291.1. Alena Zabloudilova 291.3. The following day was a scheduled rest for all. It gave everyone a chance to breath, take a step back and re-evaluate the situation. Again, both Alena and Ashley had chosen to take an additional rest day, meaning that to complete all six performances, they would need to dive on both of the remaining days. Alena had the lead, but Ashley was proving to be a worthy adversary. From here on out, it was all new territory for Alena, every dive had to be a personal best, every dive had to be a white card. So the question was, where did she stand to make the most points? Whilst we calculated and deliberated on different options, we finally decided on was a 65m constant no fins dive. With Ashley having gone five meters deeper in this discipline, but with the scoring system meaning that she actually had a 7.5 point lead, every meter was worth more points. This would close the gap in no fins and potentially stretch Alena’s overall lead a little more. That evening, as per usual, announcements went in at five o clock. Anticipation was high waiting for the next days start list and after what seemed like an eternity of waiting, the start list was finally published. We scrolled down the list to find Ashley’s announcement, and it took us by surprise. Her and Ren had continued their aggressive approach and announced another national record, another five meters jump on her previous constant weight dive with an announced performance of 87m CWT. When we calculated and tallied up the points, should both girls be successful in their dives, for the first time in the comp and with only one dive yet to come, Ashley would take the lead. Day eight was a rather drab and miserly day. Overcast with little sun and a biting cold breeze drafting through, it was not the sort of day that drew you towards the water. And nor was the blue hole particularly inviting that day. 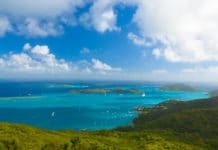 Many of you would have seen the photos and videos of this beautiful unique place, however it is not always blue water and sunshine and the visibility on this particular day was murky and soup like. It was the sort of day that you would rather stay in bed eating ice cream and watching movies than to go and attempt to dive deeper than you had ever done before. 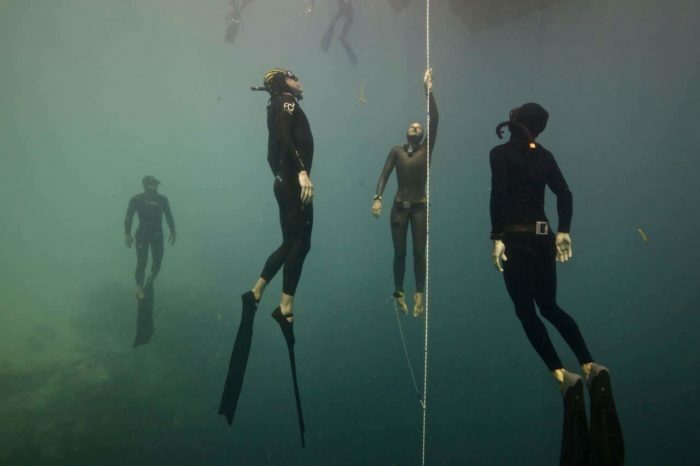 However, with the very best of the worlds competitive freedivers there to get the job done, it started in spectacular fashion with four of the male divers attempting dives to 100 meters or more. It also included not less than ten national or continental record attempts. Between the two girls, Ashley was first to the start line. Although it had already been a long competition, Ashley was feeling strong and confident as she clipped her safety lanyard onto the dive line. However, diving in a thin suit designed for performance and the tropics, the wind pierced through and she began to shiver. This would not help her equalizing. What is needed to safely compensate the ears and sinuses during the decent is complete relaxation. And for Ashley, the biggest question she was asking herself was, could she equalize down this far?! As she lay there shivering, listening to the count down, she willed Sam on to call the words “Official top”. She wanted to get moving, get warm and get the dive going! And once she did begin, as she had expected, equalization was hard. The involuntary contractions of the muscles during the shivering had caused tension, in and around her chest and core, meaning her body was less fluid and less able to conform to the pressure. She entered her free fall approximately 30 seconds into her dive. From here, she had nearly another 60m to fall and hold her concentration. With every second that passed, she fell another meter. One minute to hold on, one minute to relax and to overcome the urge to turn back to the safety of the surface. As she passed 70m, she was on the last of her ability to compensate, and at 75m, she could compensate no further. With still another 12m to go, she left things in fates hands, continuing down further. In her own words, not a smart move, but by this point she was definitely wrapped up in the competition! As she approached the plate she could feel her ears squeezing. In the darkness that consumes you, a ray of light began to shine through. The bottom plate began to come into view and the light from the attached torches shone like a beacon of hope. Finally, she made it! Touch down! In the space of a couple of seconds, Ashley had taken her tag, made her turn and began her way back to the surface. She continued on through the darkness, determined and focused, swimming towards the light, swimming towards her first breath. We followed her progress by the sonar, passed the 60, passed the 50, passed the 40 and as she approached 30m Sam gave the call, “she’s with first safety”. Ren was with her, although not yet at the surface, she was already in good hands. At twenty meters she was joined by her second safety and she continued on. Tired, exhausted from the pressure of eight days of competition, on top of weeks of training and of course from the deepest dive of her life, Ashley’s body began to slow. Her technique began to falter and as she approached the final ten meters, her body finally decided enough was enough. Air escaped from her mouth and Ren rushed in to expertly bring her to the surface. In the safety of her husbands arms, and only a few seconds after reaching the surface, Ashley came back around, confused and wondering why everyone was staring at her. Then, the let down as it dawned on her what had just happened. This opened the door a little for Alena, giving her an opportunity to extend her lead and potentially seal off the competition. But it was by no means an easy task. She would have to come to within meters of Ashley’s world record, on a day that had already proven hard for athletes to perform on. I remember talking to Alena on the beach that morning. Whilst waiting for her time to roll around, she was already feeling the cold and wind. It did not help her confidence but with the reassurance of myself and surface coach Marc Lenoir, Alena began to set her mind for what was to come. She went through her warmups and then at 12.45 PM, she clipped onto the rope to prepare for her final breath up. This dive would, in all likelihood, determine the winner of the competition. Sam counted her down and at precisely 12.49 PM, Alena slipped below the surface, causing barely more than a ripple as she began her descent into the darkness. From here, Alena transcended. She had entered a place very few know. Like a buddhist monk during meditation, she was no longer with body, no longer with mind. She was so far immersed into the dive that she actually has no memory of it. Her body ran on auto pilot, driven only by her subconscious. She pulled and she kicked a total of nine times before beginning her free fall, before sinking down with the negative buoyancy alone. She touched down at 65m to a cheer from the crowd and began her ascent. Just as she passed the 60m mark, I left the surface to meet her. Before freediving, Alena had been a high level swimmer, barely missing out on selection for the Olympics in the early 2000’s. This was apparent with her flawless technique, propelled only by her hands and her feet. When I met her at 25m she continued to swim with precision and power. Without mask and wearing only a nose clip to assist equalizing, when I looked into Alena’s eyes, she was not present. But still she continued. The years and years of swim training had conditioned her to move without thought in a strong and efficient way and with each and every stroke, she pulled herself closer to the light, closer to the surface. Only five meters from the surface, Alena gave one last final stroke. She allowed the positive buoyancy to take over and she glided to the surface. “Breathe Alena, breathe!” Shouted Marc Lenoir. Still not present, Alena’s eyes remained vacant. Again Marc shouted, this time accompanied by a telling finger commanding her to breath. Finally, Alena returned, inhaled, hooked her lips together and purposefully performed her recovery breathing. Loud shouts and cheers went up as the judges gave the white card, followed by hugs and embraces. In the women’s competition, the final day was but a formality. 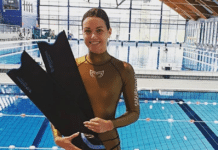 Alena still had unfinished business, she had all but secured the overall title, but she went after another national record and the gold medal for the women’s free immersion. She didn’t do any more than she needed to, choosing to add only one meter to Ashleys dive with an 82. Adding the icing to the cake, she completed the dive without issue. Having already completed her primary and secondary objectives of securing the world record in CNF and collecting national records in the other two, Ashley decided to rest, content with the performances she had put in and proud of the fact that she had kept pace with Alena for so much of the comp. As an underdog for the overall standings she had pushed Alena to the very edge and in doing so, brought out the very best of both women. And although only one of them could walk away with the overall crown, they could both feel victorious for what they had accomplished. Vertical blue 2012 was the greatest and the most tightly contested competition for the women in its now 9 year history with. 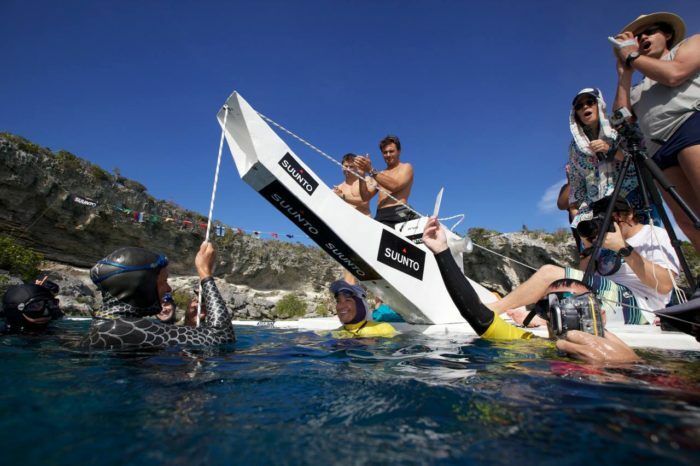 It took place in November of that year and looked to set up 2013 to be one of the most exciting yet in female freediving. Alena and Ashley were the new stars of the show and both looked to be worthy adversaries for the reigning Queen of freediving, Natalia Molchanova. However, life decided otherwise for both of them, rather than more medals, they received something even greater and more precious. They both became mothers, blessed with beautiful and healthy daughters. This has since largely prevented them from competing at the top level and opened the door to new comers. Since then, great performances have been made but none quite so impressive as that of Ashley and Alena’s. However, this year is shaping up to be different. With the newcomers having had time to mature and develop their diving, we now have three lead contenders for the overall title. They include Japanese powerhouse and last years winner, Sayuri Kinoshita, who has a particular strength in constant no-fins. Russian champion and winner of VB 2014 Marianna Kupnitskaya and South American prodigy, Sofia Gomez Uribe. All three women are well rounded performers, all with dives close to 90m and all showing potential to do even more. And as if this isn’t enough, there are three more Japanese divers competing who could well take the title of ‘Deepest woman in the world’. Tomoka Fukuda, Hanako Hiroshi and reigning champion Misuzu Okamoto. With such talent on display, this could well be another for the record books.  You can follow this years Vertical Blue competition on DeeperBlue.com or on social media via the hashtag #VB2016. 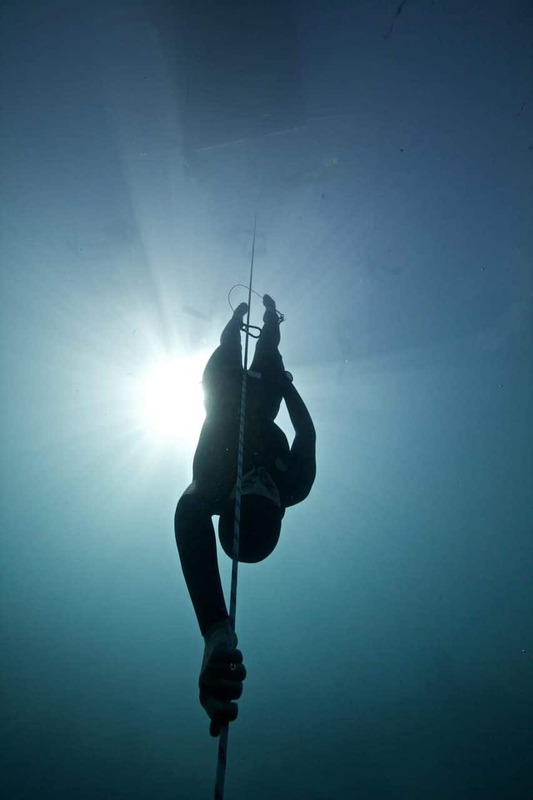 Jonathan Sunnex is one of the worlds freediving elite. Bronze medal winner at the 2013 Depth world champs, he has made dives in excess of 100m. He teaches, competes and co-organizes competitions in and around the Caribbean.